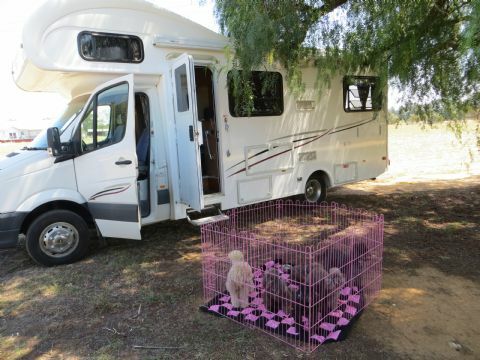 In 2013 I purchased a Talvor Stradbroke Motor home with a view to travelling ( with the poodles) to many of the lovely spots within a reasonable travelling distance from Wagga Wagga. The poodles had their first day trip to Yerong Creek( pictured) and seemed to enjoy travelling in the van. With slow and steady preparation- making sure everything is up to standard and we have all requirements for travel & staying, we are nearly ready for our first trip away. I am planning a few days at Tumbarumba ( a picturesque caravan park/ showgrounds on the banks of a lovely creek with loads of room for the poodles). After visiting there for a dog show I decided it would be a great first stay over. At the show I also researched with fellow exhibitors some pet friendly parks & showgrounds. Having camped many years ago I have an idea of the basics- but my poodles are getting older and more demanding - so taking their needs into account is a high priority. I hope to take in a few dog shows in my travels and meet up with other dog lovers rather than just stay at caravan parks and camping areas.